Since I bought my Harley, I have searched near and far for different parts and accessories to take my sled to the next level and make it "MINE". I mean, that is what we all want right? To make these factory motorcycles unique and put our own personal imprint on them. Through the evolution of my own motorcycle, I have often ran into vendors, dealers, etc. that seem to think that I am privileged to buy their product or ride their motorcycles. I actually have grown quite tired of this attitude and, as a result, have stopped doing business with these individuals. However, that's not what this is post is about. 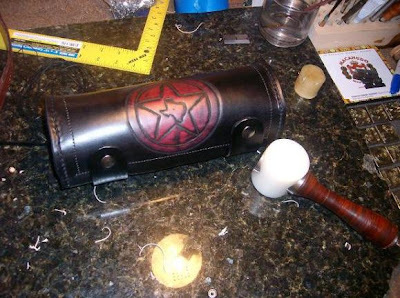 I am pleased to be able to introduce you to a business I've discovered that specializes in leather products like swingarm bags, tool rolls, and custom seats. I have had the opportunity to converse via email with the owner, Shaun Oneal. What I have found is the same that many of his customers have found. He is friendly, eager to answer questions, and happy to have your business. That's something I've found a shortage of in the motorcycle aftermarket. People just don't seem happy to have your business anymore. 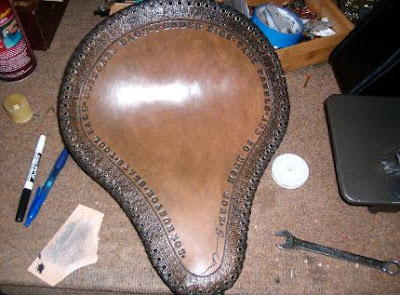 If you take a look at Shaun's website, you will see his craftsmanship is stunning and he can do just about anything. I am a frequent poster at www.hdforums.com, and Shaun regularly receives rave reviews from customers. While, I haven't ordered my swingarm bag yet, it won't be long. I will certainly post pics and reviews afterwards. Until then, here are some pictures of Shaun's work that I've gotten off his website, www.sokustom.com, with his permission of course. My personal favorite, the solo swingarm bag. 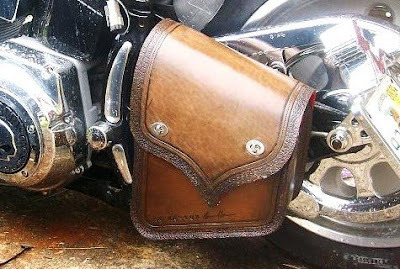 I'm not a fan of saddle bags. At least not on my bike. However, I do like to have a few essentials with me. This bag makes it possible without converting to 100% bagger. And lastly, these seats scream old school craftsmanship! From my short emails with Shaun, I have found that he is a family man, loves to ride, and is carrying on a family tradition in working with his hands. These are all qualities I embrace, and I hope you will visit his website, or jump over to http://www.hdforums.com/ and ask for references, you'll get plenty.